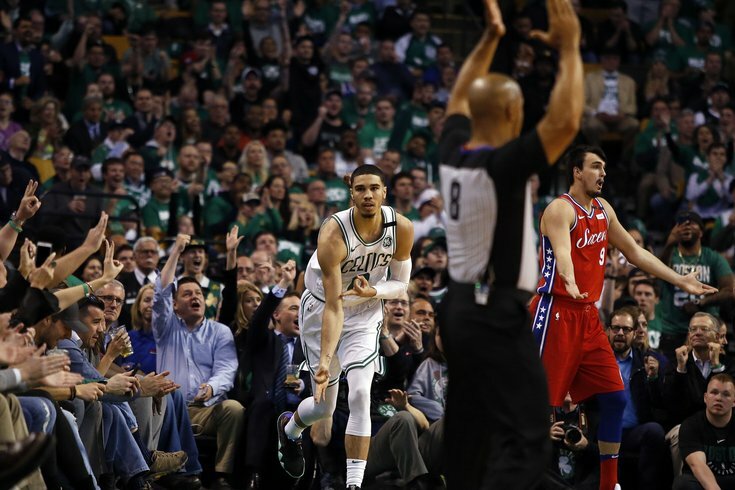 Boston Celtics forward Jayson Tatum reacts after making a three point shot over Philadelphia 76ers forward Dario Saric. After eliminating the Miami Heat in five games – and having nearly a week off – the Sixers return to action on Monday night as they travel to Boston for the Eastern Conference semifinals, where they'll the second-seeded Celtics, who needed seven games to eliminate the Bucks. The Celtics, already without Kyrie Irving, will be without Jaylen Brown for Game 1. Brown was officially ruled out with a hamstring strain in the hour before tip-off. The Sixers meanwhile, are fully healthy – minus Joel Embiid's still-healing face, which will continue to require him to wear that mask. Follow along here during the game for live updates as the action unfolds.